Please refer to our stock # mdl3 when inquiring. This amazing contemporary bracelet has a design that is both edgy and sophisticated at the same time. It is hand crafted from polished and oxidized brass and has an interior measurement of approximately 7". 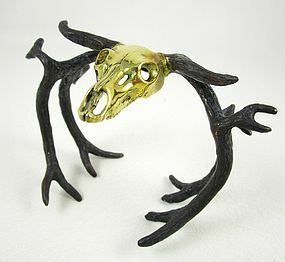 The front skull is 1 1/2" wide and the flanking horns flair to 1 3/4" at the widest point. The metal is slightly flexible so it can be bent to fit most average sized wrists. It is in excellent condition.